Lead developer Jack Norris sums it all up in his foreword: the science-fantasy that is Barsoom is one to capture the imagination and hold on to it; and his delight at getting to play in this world shines through these pages. The presentation reaches out to embrace you too, starting with the sweeping red expanses of the end-paper maps. OK, I prefer portrait orientation books but... it's so lush! So on to Chapter 1: Welcome to Barsoom. If you have so far got through life without visiting, here's your chance to discover what you have missed. It begins with some notes on the author, Edgar Rice Burroughs, and on the science-fantasy planetary romance stories he wrote. 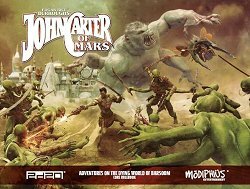 Whilst maybe best remembered for having invented Tarzan, John Carter of Mars is a much more rounded character with hidden depths - both in Carter and in the stories themselves - that rise above the whole 'pulp' genre they ostensibly belong to. Noteworthy in this setting: there isn't any 'evil'... just danger and excitement, people with differing objectives, dangerous animals and so on to contend with. There's a brief glossary covering common terms and then we turn to the pragmatic: what you need to play the game and what this role-playing is all about anyway. The three different eras in which you can play are outlined briefly, too. Next is Section 1, which contains a couple of chapters that take you through creating a character. If you are already familiar with the Modiphius house system, 2d20 or 'Momentum', it's all pretty easy, but even if it is completely newto you, everything is explained clearly. The idea is to create wholly-original characters, but if you want to play the ones from the books, they are presented later on. Characters are created using a nine-step process, beginning with the grand concept of who that character actually is, the undelying basic concept that makes them tick. Next give them some attributes which, unlike many games, are abstract and rather results-orientated rather than specifying physical and mental capabilities. So we have Cunning, Daring, Empathy, Might, Passion, and Reason. Next you choose race: there are several different Martian races as well as Earth humans (who are very unusual) to pick from. Each Martian race is defined by colour, they are fairly homogeneous and serve to provide basic background knowledge and skills. That sorted, you need an Archetype - this is basically what the character does for a living (or did) and allows for a lot of customisation. Each one provides suggestions as to what the character knows and can do; and one or more appropriate Talents are suggested for them. There are all manner of Archetypes: assassins, mercenaries, explorers, envoys, healers, rogues... and if none suits there are notes about creating your own. An interesting feature of this system is that you don't have 'skills' - competency is assumed in the things you know how to do. Now the fun starts. You need a Descriptor. Characters in this game are larger-than-life, dramatic personalities and you pick a word that describes how they approach life - bold, perhaps reckless, courageous or dashing... This has a mechanical effect, in terms of bonuses to appropriate attributes. This is followed by choosing Talents, starting renown and equipment, and a flaw. Finally, you'll need a name, and there are suggestions for how different races assign names. To aid you, there's a detailed walkthrough of character generation following the description of it, and then some sample characters. Each is presented in quite generic, yet detailed terms. If you're in a hurry, all you need do is slap a name and a few background details on and you could play a 'Stalwart Red Martian Duelist' or a 'Thoughtful Green Martian Guide' or whichever takes your fancy. A separate chapter covers Talents, going into quite a lot of detail as they are pivotal to how a character works. Talents are more than skills or learned abilities. In a game where hypercompetency is assumed, if your background suggests that you can do a thing - or someone has taught you how - you can do that thing... even if it is as complex as flying an airship. Talents are the things that make the character stand out, they can not only do that thing, but do it with style and better than most anyone else. Mechanically, you bring a Talent into play when attempting an action for which that Talent is appropriate. OK, now you've got a character. Section 2 covers all you need to know to play them to best effect, beginning with Chapter 4: Adventuring in Barsoom, a chapter which explains the basic rules for playing the game. It explains the custom Combat Dice (and how to use a regular d6 if you don't happen to have the special ones), and how task resolution works. It sounds more complex than it is, so try out a few rolls in advance of the game to get the hang of it all. Note that this is for both Narrators and players, and includes all the behind the scenes calculations the Narrator has to do in setting difficulty, etc. It covers Momentum and Threat as well, specialist mechanics that allow player-characters to capitalise on their success - and the Narrator to make things more 'interesting' for them. There is also detailed information on Action Scenes - typically combat - when turn-by-turn tactical play is required. It ends with Damage and Recovery, and Luck. Luck reflects the fact that the Player-Characters are a cut above ordinary people, and gives them a small mechanical advantage - points to spend on die rolls or to influence the story. They are earned back by good role-play. Next comes Chapter 5: Weapons, Technology and Equipment. There's a selection of weapons, a description of the appearance and significance of the traditional Martian 'harness' (they hate clothes, apparently), and a range of equipment for various purposes. In line with the heroic style, it's generally assumed that a character has whatever they need, unless its absence is part of the plot. The technology chiefly covers the forms of transport unique to Barsoom, but also covers biological science. The last chapter in this section is Chapter 6: Growing your Legend which covers experience, character development and the acquisition of Renown. This is the measure of a character's social and political position, their fame in the community, something vitally important and which can be used to gain accolades or titles. We then move on to the setting, Barsoom itself, in Section 3, with chapters covering the history of Barsoom and looking at the societies of the various colours of Martian. There's a heady mix of biology, geography and everyday life - religion, social behaviour, warrior customs, slavery, clothing, food and drink (sadly it sounds rather dull), and more. Entertainment, crime, technology, architechture, it's all there. A note is added that the game background reflects that of the Burrough's stories, with things like slavery and gender-designated roles which some modern players may find objectionable. They can always make changes to suit their sensibilities. A chapter on The Green Hordes covers the most common species of Martian, the Green Martians, then The Red Kingdoms does the same for Red Martians (including loads of detail about their cities) and the next chapter in this section looks at the rest of the planet, primarily the northern ice cap, which is a lot more lively than you might think. Finally, the rest of the Solar System is covered in Beyond Barsoom. Section 5 is Narrator territory, with advice on running the game, a bestiary, a chapter on the secrets of Barsoom and a collection of Champions of Barsoom (this is where you look if you want to play John Carter or Dejah Thoris themselves), loads of interesting and powerful folk for the party to meet and interact with. The advice is sound, much of it applicable to GMing any game, and other bits appropriate to this game in particular (or at least, the sort of sweeping science-fantasy feel this game aims to achieve). There are snippets about using the game mechanics to best effect, and ways to utilise the style of the original stories and their conventions in your game... and how to expand upon the 'known world' in a fitting manner. The creatures in the bestiary all come with descriptions and even plot seeds involving them, and many are illustrated. There are notes for designing your own beasties too. I'll not talk about the Secrets of Barsoom here: suffice to say there are a good few plot ideas therein! Strange places to explore, too. Chapter 16: Mind Merchants of Mars is a full-blown introductory adventure which opens with the party fighting in an arena as slaves - they'll get a chance to find out how they got there after the fight is over! Then they will probably start to plot their escape... but of course, nothing is plain sailing. Assuming they survive, the next chapter is jam-packed with ideas for further adventures. Plenty there to fill many a gaming session with adventure. This game captures the epic, planetary romance feel of the original stories well. If you enjoyed them, you will relish the chance to live in Barsoom yourself. If you've never read them, there's sufficient here to get you going (and probably inspire you to track the books down as well). Definately a fun addition to your game collection, perfect for when you need a well-constructed, exciting yet light-hearted game. Return to John Carter of Mars Core Rulebook page.